One of the great things about radio and podcasts is that you can listen to them and learn about any number of a million different things while at the very same time doing any number of a million other things. For example, as you drive to work in the morning you can turn on the radio and learn about all kinds of things that are happening in your town or around the world, but you can’t drive to work and read the paper. And while it would be extremely awkward to try to exercise or fold the laundry while watching a documentary film or attending a public lecture you can put on a podcast and listen comfortably as you complete any number of your daily tasks. But there is one thing that we will never be able to do and at the same time still be able to truly listen. We will never be able to speak and listen at the same time. Not even simultaneous interpreters (you know, the people who translate at super important multilingual events like the United Nations) are able to speak without first listening. It seems like they are speaking and listening at the same time, but really what they have learned to do is to be extra quick to listen, and most of their training is centered not on speaking but on practicing extremely focused listening. One of the ironies of Christianity is that the most famous Christians tend to be Christian speakers, teachers and preachers. This is ironic because what we see emphasized in the teaching of the New Testament is that the practice of listening should be of far greater value and should be far more celebrated among followers of Jesus than speaking. It’s as we listen to God’s word, to the gospel, to the teachings of Jesus, and to the leading of the Spirit that our lives are transformed and we become more and more like Jesus. Good preaching and teaching are invaluable to the life and mission of the Church, but without good listening (on the part of preachers and teachers in particular) no amount of preaching or teaching will help us. Listening must come first. I hope you can join us as we gather this Sunday not only to sing God’s praises and to offer our prayers but, first and foremost, to practice listening together, not to the music or even the preacher but to God. And I hope that you will pray for all the preachers and teachers and for the worship leaders who will be preaching and teaching and leading this Sunday. 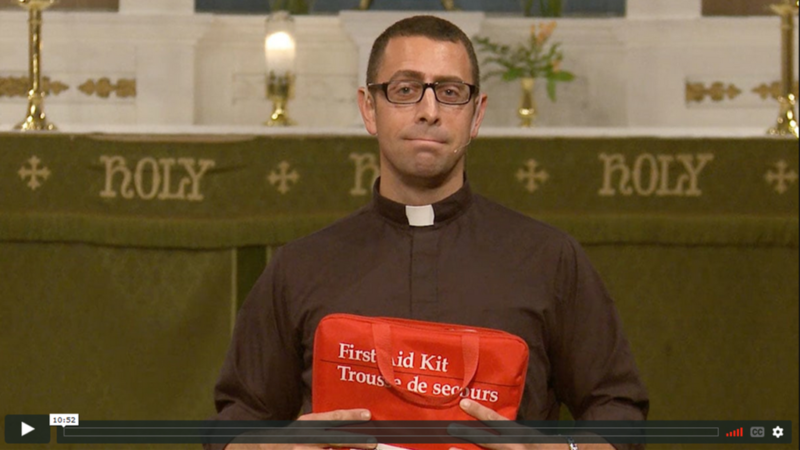 Please pray that as they prepare to preach and to sing and to lead the prayers and to read the scriptures that they would be quick to listen and that they would continue listening so that on Sunday God is the one who is ultimately heard. As school begins so does our regular routine! Check the Newsletter below for upcoming events happening this fall! Reminder September 16, 2018 we are returning to 8:45 am and 10:30 am service schedule. Children’s ministry during the 10:30 am service. Our first ever Camp on the Road was a huge success. More than 30 campers experienced four days full creative fun and Christian Community. Thank you so much to everyone who provided the time, talent, prayers, and donations that made this event possible! The world is in desperate need of more love, more joy, more peace, more patience, more kindness, more faithfulness, more gentleness, and more self-control. But where are these going to come from? 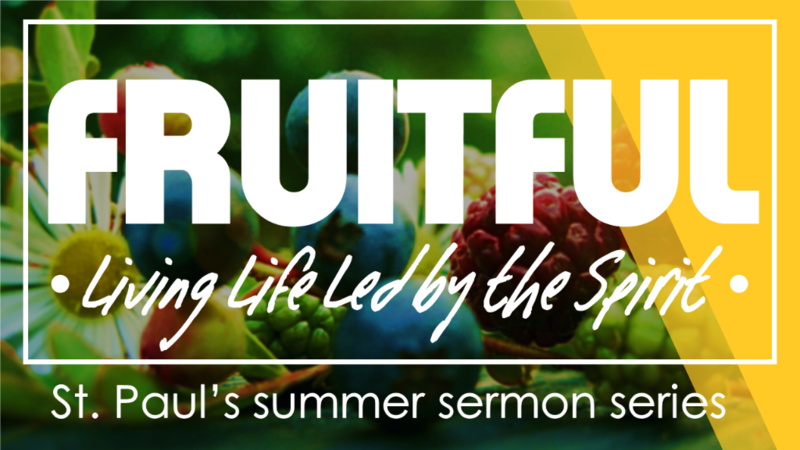 This summer at St. Paul’s we are exploring what Galatians 5:22 calls “The Fruit of the Spirit,” and looking in detail at the kind of spiritual growth that makes more love, joy, peace, patience, kindness, goodness, faithfulness, gentleness, and self-control possible. Our hope is that we’ll not only grow in our understanding of how genuine spiritual growth works but that, in the process, we’ll get to experience that growth for ourselves. * And Get a handle on Self-Control (Aug. 19).